I AM becoming increasingly alarmed, in the run-up to a possible invasion of Iran, by the way British newspapers and broadcasters are reporting terrorism. Through systematic bias and the influence of a lying government, the BBC, which is supposed to be our national benchmark medium, has turned on the public and become an accessory to the crime. The coverage of the July 7 London bombings has become a frightening case of trial by television. Unfortunately, as evidence to the contrary trickles out, our media editors' verdict looks increasingly questionable. 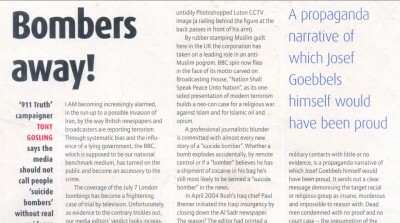 The BBC crossed a lethal professional line when it decided to refer to the four 7/7 suspects as 'suicide bombers'. Ignored is inconvenient evidence including the advance warning to the Israeli embassy and the untidily Photoshopped Luton CCTV image (a railing behind the figure at the back passes in front of his arm). By rubber stamping Muslim guilt here in the UK the corporation has taken on a leading role in an anti-Muslim pogrom. BBC spin now flies in the face of its motto carved on Broadcasting House, "Nation Shall Speak Peace Unto Nation", as its one-sided presentation of modern terrorism builds a neo-con case for a religious war against Islam, and for Islamic oil and opium. A professional journalistic blunder is committed with almost every new story of a "suicide bomber". Whether a bomb explodes accidentally, by remote control or if a "bomber" believes he has a shipment of cocaine in his bag he's still most likely to be termed a "suicide bomber" in the news. In April 2004 Bush's Iraq chief Paul Bremer initiated the Iraqi insurgency by closing down the Al Sadr newspaper. The reason? The editor had printed a front-page lead story that a "suicide bomb" in a bus queue was, according to eyewitnesses, a missile fired from a helicopter. The newspaper was closed down by the US Army the next day. This simple lie, referring to a "suicide bomber" on the say-so of anonymous military contacts with little or no evidence, is a propaganda narrative of which Josef Goebbels himself would have been proud. It sends out a clear message demonising the target racial or religious group as insane, murderous and impossible to reason with. Dead men condemned with no proof and no court case - the presumption of the "suicide bomber" is not only bad journalism, it seeds genuine terrorism. When a racial or religious group, after false-flag attacks, becomes demonised and targeted by racists it begins to fight back. Thus is real terrorism born. and critique the list itsself there if you wish anyone. Posted: Sun Dec 24, 2006 1:21 am Post subject: Hear, Hear. Anyone short of a village idiot, and of course the likes of "sturdy professional journalists" within the likes of the BBC should be able to work out who is REALLY in charge of the illegal drugs trade. Good on ya Tony, and thanks again. Posted: Sun Dec 24, 2006 1:27 am Post subject: Re: Hear, Hear. Bang on Tony. And which 'efnic' group runs the BBC again? The criminals' quality control is really pretty poor. They leave gaping holes in their alibis, and even get caught red-handed. An honest legal system would have this government & their puppet masters over a barrel on evidence that anyone on this forum could present. So how come we cannot simply challenge our governments in court over 911 and 7/7? How come we are limited to our 'designated protest area' - the internet? Could an organisation like NUJ (or active group within) not provide a focus for a court challenge and out and out blitz on media lies? So would it be fair to say most of the lies printed in the newspapers are written by members of the NUJ? Who are the gatekeepers of the NUJ? The editors and proprietors, or where have you been? Nice of TTWSU3 to miss the point so diabolically. Just take a look at his posts and you'll see what the other side will say if they manage to elbow their way in to one of our meetings. Flagged yourself up good and proper mate! Controversial September 11th documentary exposing inconsistencies and contradictions in the 9/11 Commission Report erupts onto New Zealand television. This recent national airing of "In Plane Site" on New Zealand television represents a historic turning point in the global collective consciousness regarding the terrorist attacks of September 11. Columbia MO December 23, 2006 -- On December 16, 2006, while most Americans slept, Television 3 New Zealand debuted the provocative documentary "911 In Plane Site" on national television. The film presents photographs and video footage from that fateful day, as well as computer-aided analysis focusing on the Pentagon and World Trade Center buildings One, Two and Seven. Also examined are dozens of independent and mainstream media news reports from the morning of September 11 that highlights inconsistencies and contradictions in the "official" account. Saturday night's national airing of "In Plane Site" on New Zealand television represents a historic turning point in the global collective consciousness regarding the terrorist attacks of September 11. After all, it was only months after the second national airing of "In Plane Site" on Australia's Network 10, which kicked off a firestorm of debate leading to Federal Labor politician Michael Danby's demand that the programming director of Network 10 be fired for airing the program. Mr. Danby said that September 11 victims had been killed twice - once by the terrorists and once by Ten. However, Mr. Danby's highly publicized comments did not seem to dissuade worldwide public interest, as a spokesman for Network 10 stated that a unified public reaction to the film had generated a massive wave of phone calls to station operators praising the network for its airing of the program. Producer Dave vonKleist says that support for the documentary remains a global phenomenon. The international news program Out There Television was the first syndication to take the controversial film into thirty-one countries in a single airing. The internationally available Namaste Magazine has made the documentary available to those in Europe since it's release in mid-2004. Nexus Magazine, also internationally available, has been a continued advocate, as well as other organizations in North and South America, Europe and Asia. Shining the torch of truth to Spanish speaking nations is outspoken World Trade Center survivor, William Rodriguez. Rodriguez was the last person to escape the World Trade Center buildings before they collapsed and was witness to a deafening and massive explosion, which seemed to emanate from between sub-basement B2 and B3 of Two World Trade Center moments before UAL Flight 175 struck the tower. He believes to this day that explosives were utilized in the demolition-style, pancake collapse of both World Trade Center towers. Commenting on some of the video evidence, which is contained in “911 In Plane Site,” NASA engineers Jim LeGarde and Dale Carros, in a recent interview at the National Press Club in Washington, D.C., called into question the integrity of the 9/11 Commission Report by drawing attention to the fact that World Trade Center Towers One and Two collapsed into themselves much faster than basic physics will allow, when taking into account the physical resistance forces that are present with any building collapse. Adding confirmation to this heated controversy, Van Romero, an explosives expert and former director of the Energetic Materials Research and Testing Center at New Mexico Tech, said on September 11, 2001 "My opinion is, based on the videotapes, that after the airplanes hit the World Trade Center there were some explosive devices inside the buildings that caused the towers to collapse." Mr. Romero's comments have been widely censored in the U.S. press. The curiosity surrounding the video and photographic images seen and discussed in the documentary has led to its mass airing in both public and private venues in the United States. It has also led to scathing criticism and rebuttal from U.S. mainstream media sources, including FOX News journalist Geraldo Rivera, syndicated talk show host Glenn Beck, CNN's Anderson Cooper and Popular Mechanics magazine. To date, no U.S. based news program has aired the documentary in its entirety. What a pity this countries TV stations dont have the balls to air something like this. Maybe it would wake up a too many people and we cant be having that can we? Oh no, that would just not do. At least channel 5 are putting on a program about Davis Icke tonight, (even though they bottled it with Loose Change) not that anybody will be awake to watch it ay 11pm on boxing day. Just got a PDF of this article from all those years ago - it would never get into the anodyne NUJ magazine, with a new editor, nowadays - that's for sure - ALL publications are being subsumed into the New World Order. Washington, D.C. – A new Pentagon legal guide, the “Department of Defense Law of War Manual,” which encompasses the legalities of war for all four branches of the U.S. military, explains legally acceptable methods of killing opposing soldiers. The “Law of War Manual” details acceptable means of killing to include cutting, stabbing, bombing, exploding and shooting the enemy, while the use of poisons or suffocating gasses are strictly prohibited. Surprisingly, the killing of troops that are retreating was deemed legally acceptable. Perhaps the most troubling section of the manual relates to the manner in which journalists are treated in a designated war zone. “In general, journalists are civilians. However, journalists may be members of the armed forces, persons authorized to accompany the armed forces, or unprivileged belligerents,” the “Law of War Manual” asserts. Not that they haven't been targeting and killing journalists for yonks, but this makes it 'Official'! I wonder if this will wake up the NUJ, Reporters Without Borders, Committee to Protect Journalists, Journalists Against Torture etc.? 2. remote detonated: is carrier aware bomb is in car or rucksack? 3. is bomb actually guided missile fired from drone or at high altitude?